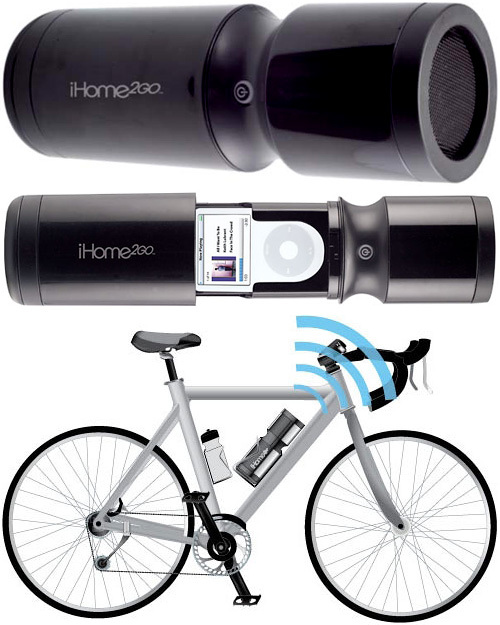 iHome2GO iH85B Bike To Beach iPod Speaker System | OhGizmo! If you live in a downtown setting and have opted for a bicycle instead of a car, it’s not the best idea to ride around listening to your iPod with headphones on, since it will tend to block out all the sounds around you. On top of that, controlling the touch sensitive iPod while keeping an eye on the road isn’t easy. So think of the iHome2GO iH85B as a sort of stereo system for your bike that makes enjoying your MP3s easier and safer while riding. Your iPod sits safely inside a water-resistant speaker case that attaches to your bike frame with an included mounting bracket. Since it’s designed to accommodate some of the larger iPods, the iH85B is slightly bigger than a standard water bottle, but should still fit inside most frames. Not only does the setup allow you to listen to your music while riding, but you can still easily hear what’s going on all around you. Of course with your iPod sealed inside the speaker you don’t have access to its controls, so the iH85B also includes a wireless RF remote that mounts to your handlebars. The simple button layout is like a larger version of the iPod Shuffle, making it easy to use even while you’re out on a ride. The iHome2GO iH85B is available on the iHome website for $79.99.